Construction or preliminary work has begun on three new pipelines designed to flow new supplies of natural gas from Azerbaijan to consumers in Turkey, Bulgaria, Greece, and Italy. For more than a decade, companies have been announcing proposals to build new natural gas pipelines to connect natural gas resources in Russia, Central Asia, and the Middle East with consumers in southern Europe. In contrast to the three new pipelines considered in this article, most of these projects have failed to advance. These three new or expanded pipelines would reach from Azerbaijan's eastern edge on the Caspian Sea to Italy's southeastern shore. The South Caucasus Pipeline Expansion (SCPX), from Azerbaijan to the Georgia-Turkey border, began construction in Azerbaijan at the end of June. 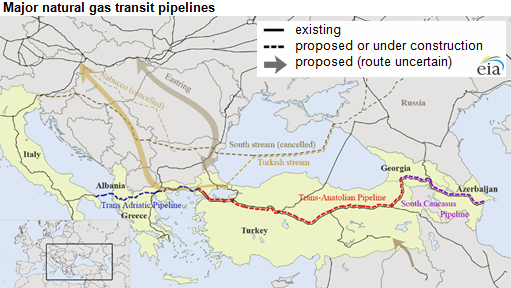 The Trans-Anatolian Natural Gas Pipeline (TANAP), from the Georgia-Turkey border to the Turkey-Greece border, officially started construction in March 2015, and the Trans Adriatic Pipeline (TAP), from the Turkey-Greece border to Italy, plans to start construction in 2016. SCPX and TANAP are scheduled to start operations by 2019 and TAP by 2020. Turkey and Italy have contracts to receive 0.6 billion cubic feet per day (Bcf/d) and 0.8 Bcf/d of natural gas, respectively, while Greece and Bulgaria each are contracted to take 0.1 Bcf/d. Although historically an oil producer, Azerbaijan's importance as a natural gas producer and exporter is growing. Until 2007, Azerbaijan was a net importer of natural gas, largely dependent on imports from Russia. Azerbaijan was also dependent on Russia as a transit country for its oil exports until 2006. The Baku-Tblisi-Ceyhan (BTC) oil pipeline, which began operating in 2006, and the original South Caucasus Pipeline (SCP), which began operating in 2007, provided transportation capacity out of the Caspian region that did not rely on crossing Russian territory. There have been a number of other proposals for pipelines into Turkey and from Turkey into Europe over the past 10 to 15 years, many of which have been canceled or are otherwise on hold. The Nabucco pipeline project, which was planned to flow natural gas through southeastern Europe to connect with existing natural gas pipelines in or near Austria, was abandoned in 2013. The South Stream pipeline, proposed to carry gas out of Russia and into Bulgaria and eastern Europe, was at one point about to begin construction, but was delayed by disagreements with the European Union (EU) over EU natural gas and electricity market legislation. Discussions to restart the project stalled after Russia's involvement in Crimea, and in December 2014 Russian President Putin canceled the South Stream project. The Turkish Stream pipeline project was announced at the same time as the South Stream pipeline cancelation. The proposed Turkish Stream pipeline, backed by Russia's majority state-owned natural gas company Gazprom, would have the same capacity to transport natural gas from Russia across the Black Sea, but it would make landfall in Turkey, which is not an EU member country, instead of Bulgaria, which is an EU member country. However, Russia and Turkey have been unable to reach a final agreement on the pipeline and, in July 2015, Gazprom canceled its contract with Saipem, the Italian company contracted to lay the first part of the pipeline. The future of the Turkish Stream pipeline is currently uncertain, but among the more recent pipeline proposals are Russia's as-yet-unnamed proposed onshore extension of the Turkish Stream pipeline, which would take natural gas across Greece before heading north to Austria. Other potential pipelines include a proposal to build a bidirectional pipeline called Eastring from Slovakia, through Hungary and Romania, connecting to Turkey through the existing Trans-Balkan pipeline. Future possibilities for moving natural gas to Turkey and Europe also involve natural gas exports from Iran and Iraq. The lifting of sanctions on Iran would allow European countries to import gas from Iran. Although Iran already exports natural gas to Turkey, it has long had plans to export larger volumes of natural gas through Turkey to Europe. However, other hurdles would remain, including agreeing on a natural gas price and meeting Iran's growing domestic demands for natural gas, especially for enhanced oil recovery, power generation, and winter heating. Turkey continues to negotiate with the Kurdish Regional government and the Iraqi government on building a natural gas pipeline from northern Iraq to Turkey; while no agreement has been reached, BOTAS, Turkey's state-owned pipeline company, has begun extending the domestic natural gas transmission system to the Iraqi border.